DIY: Ray Gun Christmas Tree Ornaments! 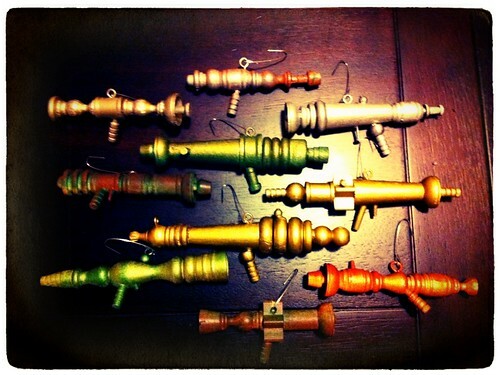 DIY: Ray Gun Christmas Tree Ornaments!, a photo by Sanctuary-Studio on Flickr. As mentioned in my last post my Dad made us some super awesome ray gun ornaments. They're all so unique I thought a group shot was in order! Thanks, again, Dad! They look great on the tree! Life: We Have A Lot Of Mouths To Feed! Life: Mini Ray Gun Ornaments! Life: Rayguns & Rocket Ships! Life: A Very Star Wars Xmas! Life: (Re)Growing Green Onions UPDATE! Life: One Of The Secret Ingredients! Life: Egg Schnocker In Full Effect! Art: Our New Jeff Soto Piece!! !